To defend the euro, which is a straitjacket for the weaker European economies and for all the European peoples. The euro is an instrument that serves the big private companies and the European elites (the richest 1%). If Eurozone countries could devalue they would improve their competitiveness against the Austrian, Benelux, French and German economic giants. |2 Countries like Estonia, Greece, Italy, Latvia, Portugal, Slovenia and Spain are restricted by their adhesion to the Eurozone. So the European authorities and governments implement ‘internal devaluation’, which means pay-cuts for the workers. George Papandreou’s government, led by the Greek socialist party, PASOK, but enacting neoliberal dogma, had become increasingly unpopular. Finally, under pressure from the ECB and the European leaders, it was replaced, without any democratic election, by a new government of national unity formed of a PASOK-New Democracy coalition, with key portfolios in the hands of ministers coming directly from the banks. Just before the G20 meeting in Cannes at the end of October 2011, George Papandreou had announced a referendum on the latest plan to be imposed by the Troika; it never happened. It was clear that if the Greek people were consulted they would reject austerity. So the Troika, supported by the G20, forced Papandreou to abandon this basic democratic initiative. To complete the picture we can add three other items of good news for the ECB and its directors. The Italian Prime Minister, Silvio Berlusconi, was forced to resign in late 2011 and was replaced, without elections, by Mario Monti, a former European Commissioner, very close to the banking community, who formed a government of technocrats to impose severe neoliberal policies. |7 In Spain, the head of government, Mariano Rajoy, President of the People’s Party, has radicalized the neoliberal policies initiated by his predecessor, the Socialist José Luis Zapatero. Lastly, European leaders |8 came to an agreement in March 2012 on a Treaty on Financial Stability, Coordination and Governance (TSCG) that further supported fiscal austerity, sanctioned Member States, scraped away more of their national sovereignty and injected an extra dose of submission to the logic of private capital. |9 Finally, the European Stability Mechanism (ESM) has come into effect to better help states and banks through the next banking crises, and to help Member States struggling to find finance. 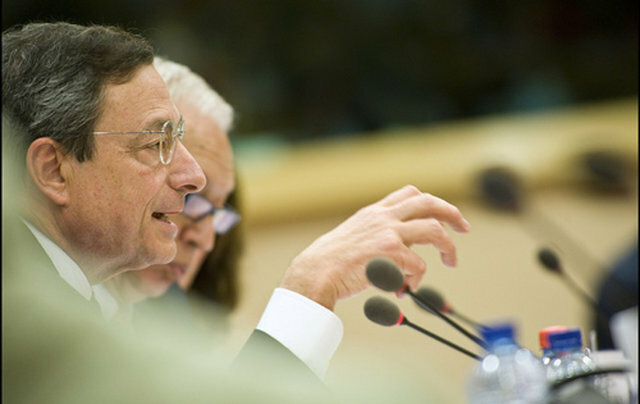 In March-April 2012 Mario Draghi, most European leaders and bank officials had much to celebrate. The richest 1% were not feeling the pinch of any crisis. At the same time, in France a majority of voters no longer wanted President Nicolas Sarkozy. François Hollande was elected on 6 May 2012. International finance looked on, knowing it could count on the leaders of the French Socialist Party, like other European socialist parties, to pursue austerity. The situation in Greece is more annoying for the ECB as SYRIZA, the radical left coalition that promises to repeal austerity measures, suspend the repayment of debt and challenge European authorities, could win an upcoming election. For proponents of European austerity policies, this must be prevented at all costs. On the evening of 17 June 2012, to the relief of the ECB, European governments and boards of large companies, the right-wing New Democracy party was ahead of SYRIZA by 2%. Even the new French Socialist president welcomed the outcome of the vote. Europe could continue on the road of austerity and the stabilization of the Eurozone. In July-August 2012 the Eurozone was once again under extreme pressure and, to comfort the markets, Mario Draghi declared in September that he would do everything to save the euro. The ECB started buying massive amounts of government bonds, mainly Italian and Spanish. The main subject of discussion of the European Commission, the governments and the mainstream media was the sovereign debt crisis, diverting attention away from the private banks and the Euro who are really the cause, once again, of the crisis. The situation began to ease after the ECB purchased Italian and Spanish bonds from the banks and made massive liquidities available to them. Interest -rates charged by these banks to lend to weaker countries gradually began to decline, particularly in Spain and Italy. But it is clear that the banks are not out of the rut: Belgian and French public finances must save Dexia for a third time. In December 2012, Italy came to the aid of the Western world’s oldest bank, Monte dei Paschi (the fourth-largest bank in the country). Spain had to recapitalize several banks. In February 2013 the Netherlands had to inject €3.7 billion into SNS, a mortgage bank, and in March 2013, the two main Cypriot banks were on the verge of failure. In February 2013, the Italian Prime Minister, Mario Monti, suffered a crushing electoral defeat. The ballot-box protest carried a new political movement centered around the comedian Beppe Grillo. The vast million-strong anti-austerity protests that had taken place in Portugal in September 2012 |12 were revived in March 2013 with over a million demonstrators. |13 The people expressed their rejection of austerity policies and at the same time, signs of crisis were evident among the elites. On three occasions in 2013, the Portuguese Constitutional Court invalidated the austerity measures taken by the government; in July, the finance minister resigned, causing significant turbulence. In September 2013, Angela Merkel was elected for another term in Germany, but her even more neoliberal political partner, the FDP, was rejected by the voters. They lost all parliamentary representation. Arithmetically, a centre-left government could have been established by a coalition of the Social Democrats (SPD), the Greens and the Radical Left (Die Linke), but the SPD preferred an alliance with Angela Merkel, German employers, the European Commission and the ECB were relieved. Again in 2013, the Netherlands, which had long given an impression of stability and economic success, went into profound crisis when its real-estate bubble finally burst and caused an economic recession. In a country where the pension scheme is largely privatized, several pension funds reduced the amount of pensions. In Spain, Podemos, a new radical left organisation created in January 2014 is ahead of the PP and PS, the traditional political parties that have alternated terms of office for the last forty years, since the end of the Franco regime. Podemos is calling for a public debt audit and a restructuring of the debt. At the other end of the Mediterranean, Syriza is, since the European elections in May, the biggest party in Greece. Early elections may take place in 2015. Syriza calls for restructuring of the debt and a conference of European States to organise reducing debt. This rapid retrospective of the management of the Eurozone crisis between the end of 2011 and the end of 2014 shows that the European leaders, at the service of big capital, increasingly choose to override the legislative bodies and side-track the voters’ choices. The European leaders have gradually eliminated the dêmos |17 from democracy, replacing it with banks and thus creating a bankocracy. This is, of course, a simplification, but it does indicate a reality. Where is democracy when the people no longer have the possibility of expressing their massive rejection of austerity policies through voting, or when the voters’ choices are ignored or swept aside because they have not made the choice the elites have decided on? Examples abound: In 2005 in France and the Netherlands after the ‘No’ vote on the Treaty for a European Constitution, in Ireland and Portugal after the 2011 elections, in Greece on several occasions between 2010 and 2012, in France and the Netherlands again after the 2012 elections. Not to mention, as seen above, the abandon of the Greek referendum of early 2012 that had been promised by Prime Minister George Papandreou at the end of October 2011. Everything is done to reduce the empowerment of national governments and public authorities within a restrictive European contractual framework. This is a very dangerous trend. The power of the ECB and the European Commission is growing, under the control of the governments of the strongest EU and Eurozone countries. The process is not irreversible. Under pressure from the populations, governments can decide to disobey the European Commission, the ECB and the bosses of the big European companies. It is clear that governments, when supported by a mobilized population, can retrieve the power to act; indeed the strength of the EU relies on the docility of the governments and the peoples. The attitude that the governments take, concerning the debt, will be decisive for the future of the rights of the majority of the population. If they bow to the European Commission, the IMF and other creditors, there can be no durable and successful alternative. |1 On the consequences of a very low inflation rate or deflation and the dangers they represent in the view of many economists, including those of the ECB, see Martin Wolf, ‘The spectre of Eurozone deflation’, Financial Times, 12 March 2014. |2 An alternative project to neoliberal Capitalism cannot be based on competitiveness. Other relationships of exchange must be developed, with important transfers aimed at reducing economic differences between countries. Also, a maximum of short producer-to-consumer circuits should be developed. |3 We have analysed the evolution of the crisis in Europe, since 2007, in numerous articles, books The Debt Crisis : From Europe to Where? and in the following French-language works: Damien Millet, Eric Toussaint, La Crise, quelles crises ? (The Crisis: Which Crises? ), La Dette ou la Vie, 2011; AAA, Audit, Annulation, Autre politique (Audit, Abolition, Alternative Politics), 2012. |4 Mario Draghi was, between 1991-2001, Director General of the Italian Ministry of the Treasury in charge of privatization. From 1993 to 2001, he chaired the Committee on privatization. As such, he was a member of the board of directors of several banks and companies undergoing privatization (Eni, IRI, Banca Nazionale del Lavoro, BNL and IMI). From 2002 to 2005, Draghi was Vice-President of the European branch of the US investment bank Goldman Sachs. January 16, 2006, he became governor of the Bank of Italy, appointed by Prime Minister Silvio Berlusconi, with a renewable term of six years. Mario Draghi became president of the ECB on 1 November 2011. |5 On the secondary market Greek bonds were sold at 20% of their value, which means that the 50% discount allowed the banks to limit the losses they would have taken if they had sold the securities on the secondary market. In addition, for the banks that had acquired the shares at 20% of their value, unloading them at said 50% was a real windfall. |6 See ‘Greek government-debt crisis’, Wikipedia, http://en.Wikipedia.org/wiki/Greek_government-debt_crisis. See also Alain Salles and Benoît Vitkine, ‘Fatalisme face à un sauvetage échangé contre une perte de souveraineté’ (‘Greeks fatalistic over swapping sovereignty for a bail-out’), Le Monde, 22 February 2012: http://www.forumfr.com/sujet448690-fatalisme-face-un-sauvetage-echange-contre-une-perte-de-souverainete.html(in French). |7 Mario Monti, Prime Minister from 16 November 2011 to 28 April 2013, was appointed Senator for Life by the President of the Italian Republic, Giorgio Napolitano. On this occasion, he left various positions of responsibility: the Presidency of the most prestigious Italian private university, Bocconi; that of the European Department of the Trilateral Commission, one of the largest circles of the international oligarchic elite; participation in the steering committee of the powerful Bilderberg club; and the Presidency of the neoliberal think tank Bruegel. Monti was an international advisor to Goldman Sachs from 2005 to 2011 (as a member of the Research Advisory Council of the Goldman Sachs Global Markets Institute). He has been European Commissioner for the Internal Market (1995-1999) and European Commissioner for Competition (1999-2004). He has been a member of Moody’s European Senior Advisory Council, an advisor to Coca-Cola, a member of the Business and Economics Advisors Group of the Atlantic Council (a US think tank that promotes U.S. leadership) and a member of the Praesidium of Friends of Europe, an influential think tank based in Brussels. |8 With the exceptions of the UK and the Czech Republic. |9 Treaty on Stability, Coordination and Governance (TSCG), March 2012. The text is available at http://european-council.europa.eu/media/639235/st00tscg26_en12.pdf. |12 Maria da Liberdade, ‘Portugal : 15 septembre 2012, le peuple était en masse dans la rue!’ (‘Portugal: a sea of people in the streets’), CADTM, 28 September 2012, http://cadtm.org/Portugal-15-septembre-2012-le (in French or in Portuguese). |13 Maria da Liberdade, ‘Les Portugais dans la rue contre la Troïka, le gouvernement et le régime’ (‘The Portuguese demonstrate against the Troika, the Government and the regime’), CADTM, 5 March 2013, http://cadtm.org/Les-Portugais-dans-la-rue-contre (in French or in Portuguese). |17 Demos (in Greek: δῆμος, ‘people’) is the Greek root to be found in ‘democracy’. In its primary sense, the demos represents all members of the civic community in the Greek city. In a democracy power of decision lies in the assembly of the demos. In literary and oratorical prose, demos represents the common people, as opposed to the rich (ploutos) and powerful.